No deal from the Brexit negotiations would be the ‘brutal’ option, Anders Fogh Rasmussen warned today as he opened a conference on Brexit in Copenhagen. 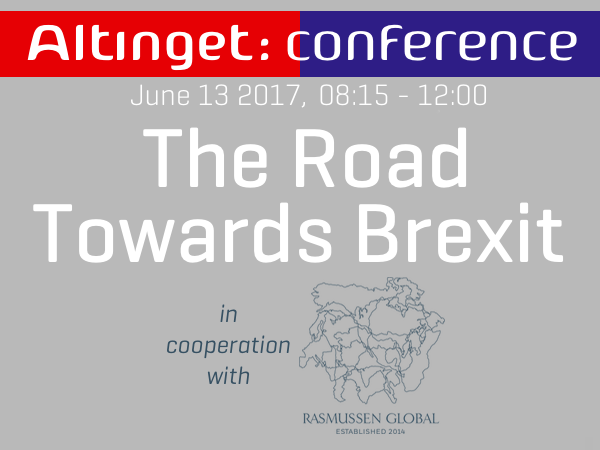 The event, co-hosted by Rasmussen Global and Danish news site Altinget, also heard from Denmark’s Finance Minister Kritsian Jensen, and former UK Ambassador to the EU Sir Nigel Sheinwald. “It is true that the Prime Minister’s mandate for leaving the Single Market and Customs Union can now be questioned. The Prime Minister has had to tear up most of her manifesto; but even if she did intend to change direction in the upcoming negotiations, the Prime Minister’s room for manoeuvre within her own Parliamentary Party is limited. “If the choices are a soft, hard or brutal Brexit, I think the events of recent days may mean we are heading towards a softer Brexit, but now we need to be clear what that means. “I believe Brexit is a disaster; not for Europe but for the UK. “Brexit will mean the UK will draw back from cooperation and the single market. You cannot cherry-pick as some in the UK have been dreaming wanting this part of the internal market but not that part of the internal market. If you start cherry-picking the other countries will ask ‘why couldn’t we do the same’? “In our post-election churn, it’s not clear whether and how the Government’s approach to the Brexit negotiations will change. I think there is a chance that it will, despite the counter-pressures. I’m personally hopeful that even if Mrs May continues, a more pragmatic approach might emerge. “For me, that would mean three fundamental things. First, realism about the length of time needed, especially for the negotiations on our future relationship, and about the need for a proper transitional period. Second, a greater willingness to look for solutions on immigration policy and the role of the ECJ in future arrangements which will allow for a genuinely close economic, trade and security relationship. And third, greater candour with the British public about the financial consequences.